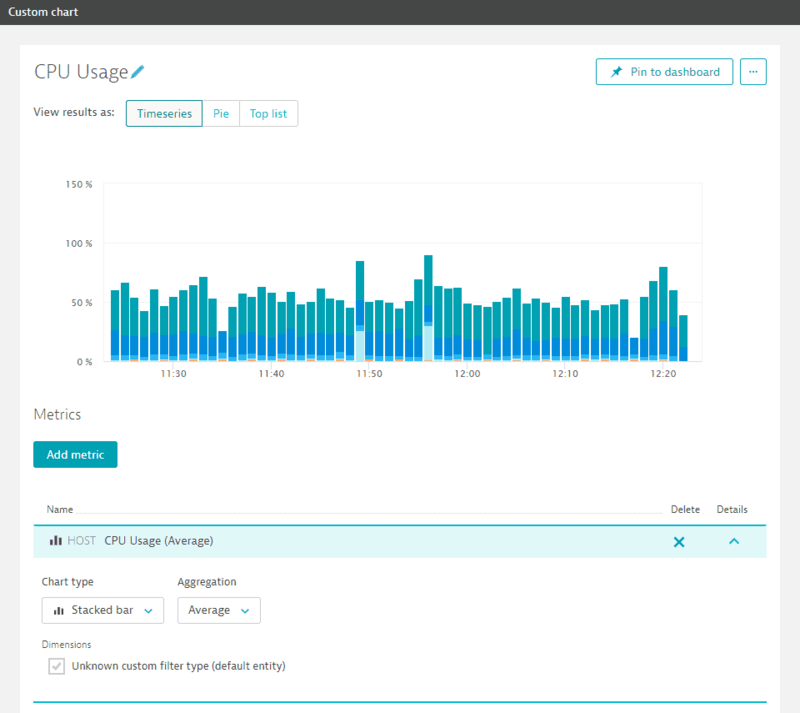 Custom charts enable you to analyze any combination of monitoring metrics directly on your dashboards. For a charted metric, a chart shows the top 15 entities. The table beneath the chart contains up to 85 more entities, bringing the total of entities available for charting to 100. You can apply splitting and filters to available entities to fine-tune the metric dimensions that appear in custom charts and to filter for only those monitored entities that are relevant to your analysis. As soon as an entity reaches one of the top 15 rows in the result table, that entity is displayed in the chart. Select Create custom chart from the navigation menu. Alternatively, you can select the Custom chart tile from the Tile catalog. From the Select metric droplist on the Custom chart page, select a metric related to the services, applications, processes, or hosts you want to analyze. For this example, we&apos;ve selected the metric Processes - JVM GC time. Optionally, select the chart type on top of the page. Expand the table row of the newly added chart metric by clicking the Details button (see highlight in image below) to access the available charting options of the newly added chart metric. Available charting options and metric dimensions vary based on the selected metric. Some charts have a Chart type droplist that provides options for different chart types (for example, Line, Stacked area, and Stacked bar). Some charts provide a droplist with options for the data Aggregation method (for example, Minimum, Slowest 10%, and Median). Select appropriate values for your custom chart. Optionally, see Splitting and filtering below to fine-tune how this metric appears in your chart. Optionally, add additional metrics to your chart by clicking the Add metric button. Pie and Top list charts can only display one metric. Click the Edit button (pen icon in the upper-left corner of the page) and type in an intuitive name for your custom chart. Once you&apos;re satisfied with your new chart, save it. Click the Pin to dashboard button. Select the dashboard, where you want to place the new chart and click the Pin button. Then click Open dashboard button. Drag the chart tile to the required position on your dashboard and resize as required. To save your changes, click the Done button. 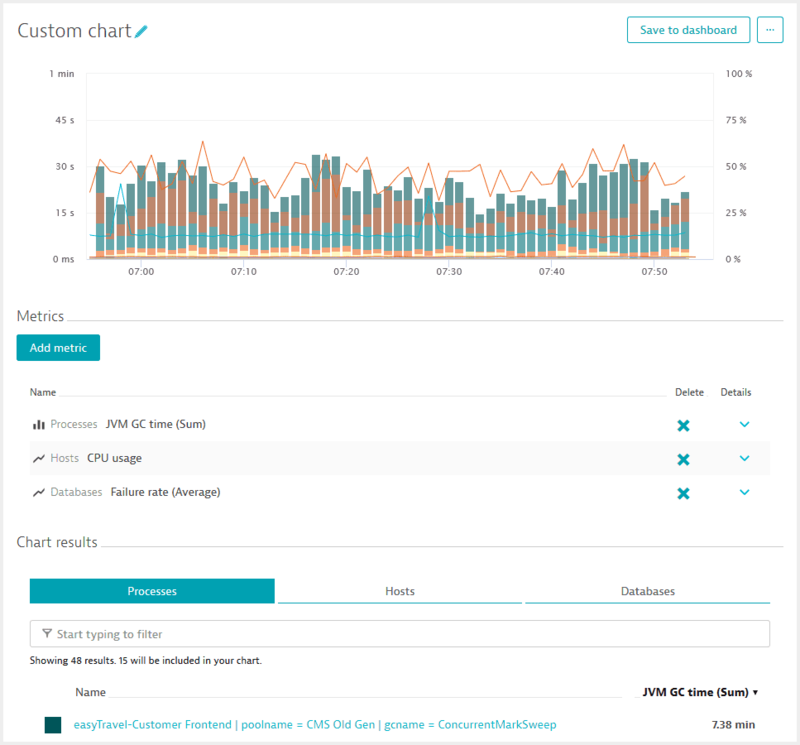 This section lists custom chart types that are available in Dynatrace. The timeseries chart supports up to 5 metrics in a single chart. Expand the table row of the required metric by clicking the Details button to access the available charting options. From the Chart type list, select the required visualization. The pie chart shows a distribution of measurements between metric dimensions. It supports only 1 metric in a single chart. 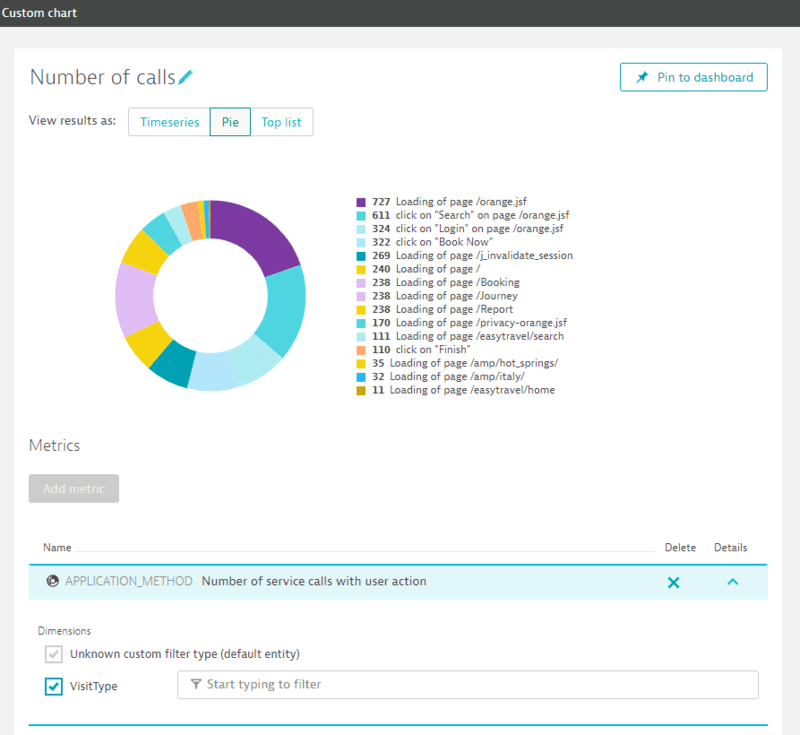 The example below shows the distribution of number of calls between methods of the demo application. Click a dimension in the legend to deactivate it and temporary remove from the chart. Top list shows up to top-15 dimensions of a metric. It supports only 1 metric in a single chart. 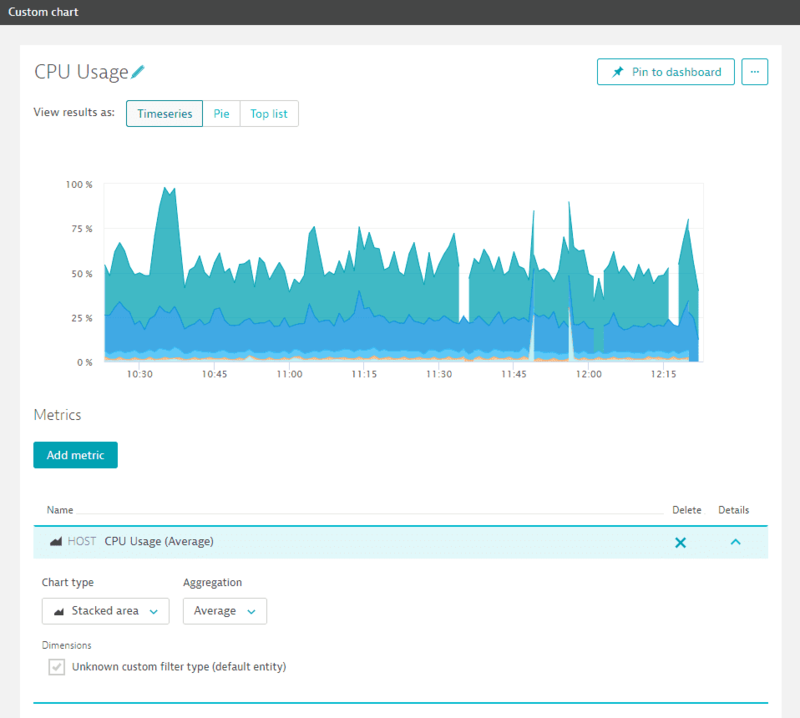 The example below shows top 5 hosts by CPU usage. When pinned to a dashboard, the top list chart displays as many entities as possible, up to the maximum of 15, depending on the size of the tile. If some entries don&apos;t fit to the tile size an overflow message, for example 5 more, is displayed. 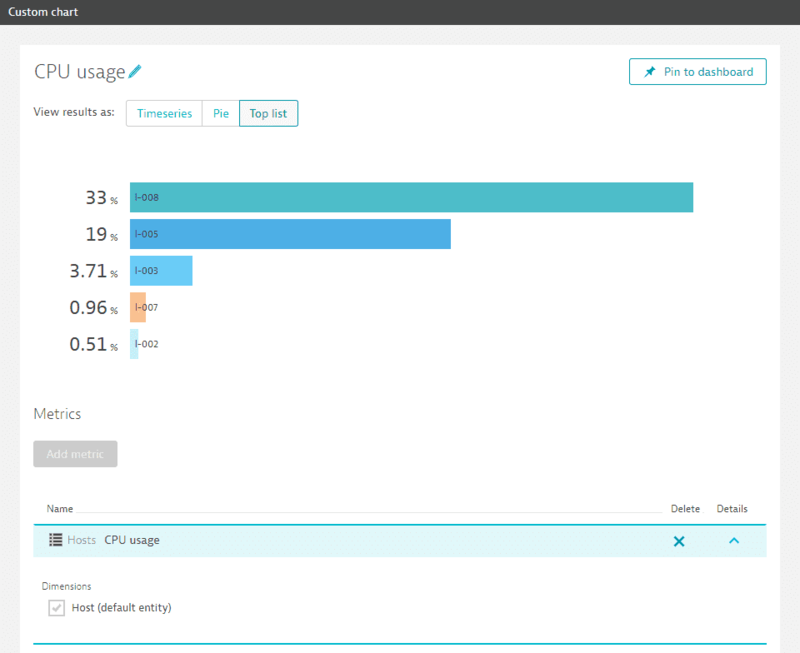 Many of the available metrics provided by Dynatrace are comprised of multiple dimensions, which you can selectively include or exclude from your custom charts (otherwise known as "metric splitting"). 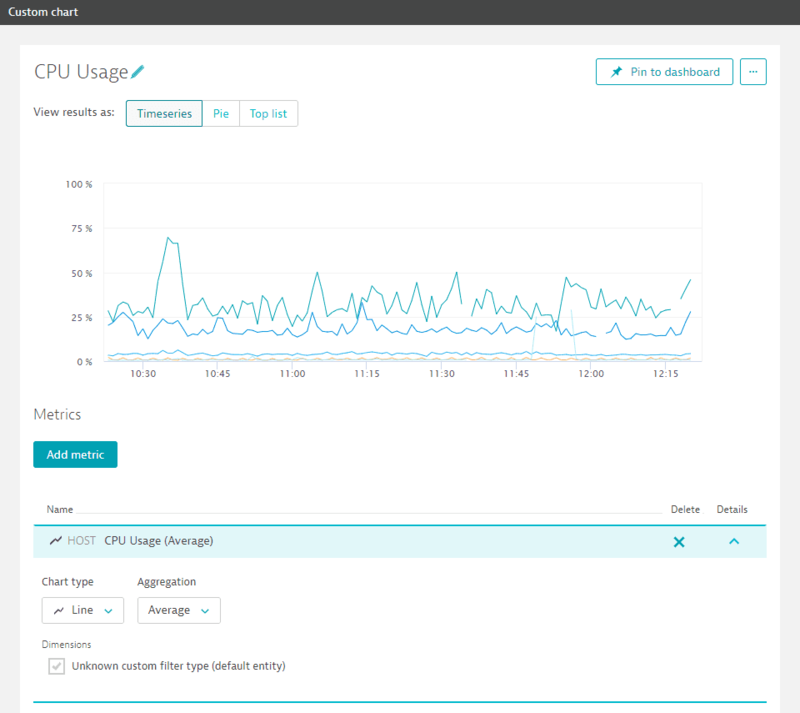 Dynatrace also enables you to subsequently filter on the constituent metric dimensions using entity tags. By selecting specific metric dimensions and then filtering on those dimensions using entity tags, you can easily isolate only the specific metric dimensions of those monitored entities that you want to chart—thereby making your custom charts far more targeted and relevant. Some metrics have varying sets of constituent metric dimensions. For example, the Processes JVM GC time metric (see example below) has four generic metric dimensions you can select for inclusion in your charts: Process (the process itself, which is selected by default), poolname, Process ID, and gcname. Continuing on from Step 3 above, expand the table row of the metric you want to split (if not expanded already) by clicking the Details button in the right hand column. Select the option box of each metric dimension you want included in the chart (the poolname and gcname dimensions are selected in the example below). All changes are immediately reflected in the chart preview above. Your changes are saved automatically. Apart from "splitting" by selecting specific metric dimensions, you can additionally apply filtering based on entity tags. Filters apply to all tagged entities across all metric dimensions, regardless of which metric dimension you apply your tags. Continuing on from Step 3 at the top of this page, expand the table row of the metric you want to split (if not expanded already) by clicking the Details button in the right hand column. Place your cursor into the Filtered by field of the metric dimension you want to filter. The list of available tagged entities is displayed in a droplist. Note in the example below (before tagging is applied) that 46 results are returned by the current metric settings. Select the tags you want to use for filtering. Just start typing to select a tag by name. Note in the example below that by selecting the CMS Old Gen tag on the poolname metric dimension, the list of matching entities has been narrowed down to 7 results.